I never planned on picking up Earth 2 but seeing it on the shelf at my local store I couldn't resist picking it up. It's part of the second wave of DC's New 52 ongoing relaunch. I have never read any of the alienate time line stuff before so this was a first for me and I have to say it was as great introduction to the concept. Upon opening the issue I was greeted with a startling image of soldiers firing up at a well rendered group of Parademons. Nicola Scott's art is wonderful from the first page and is pleasantly consistent with as much attention to the backdrop of every scene as to the action in the foreground. I am going to try and resist plastering this post with spoilers past the fact that this Earth 2 world is one that exists without the 'big three' making me think that its partially a reboot of the '52' story as well as the first alternate timeline to be part of the New 52 (DC do love that number don't they) because of this, I am expecting events to play out in a somewhat familiar fashion. 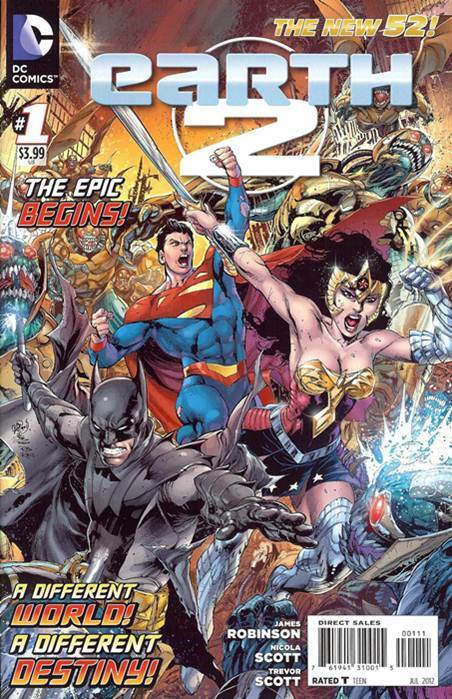 This issue tries to quickly establish the timeline and move on to the meat of the intended plot, Superman, Batman and Wonder woman are removed from this world and the 'Apokolips war' is forced to an end. Within a few pages of this we are given a tone setting conversation with the much different Alan Scott and then a touching moment with a young Jay Garrick. As first issues go it hooked me in and made me genuinely curious about how things will unfold for this second Earth and I think its probably one of The strongest first issues I have seen since the New 52 kicked off. I have already asked my Local store to add this title to my reservation list and am looking forwards to hopefully writing praises for the second issue.